Au Fil du Jardin: I've got an award! 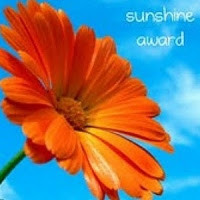 I'm excited, and very honored, to receive the Sunshine Award from Basset Momma. Basset Momma makes everyday brighter by telling the stories of Freddie and Gloria. My Passion: Anything involving needles and thread. Favorite Day of the Week: Wednesday, because that is the day movies go out. Favorite Flower: Lys, because they come for special occasions only. Have all a good weekend, and then a good week! P.S. I would NEVER have guessed that your passion involved needles and thread haha. Oh, thank you so much for sharing the award with us! :) I love it when people tell me they like the blog! 4. My passion: not sure; I like gardening and cooking and photography, but I'm not obsessed with any of the three. 6. Favorite day of the week: Saturday! I love waking up to a day full of possibilities. 7. Favorite flower: not surprisingly, roses! Congratulations on your award. I enjoy reading your blog a lot because it is so artistic and it lets me see the beauty of arts from your needle works to places that you visit. It's beautiful sunshine to me too.